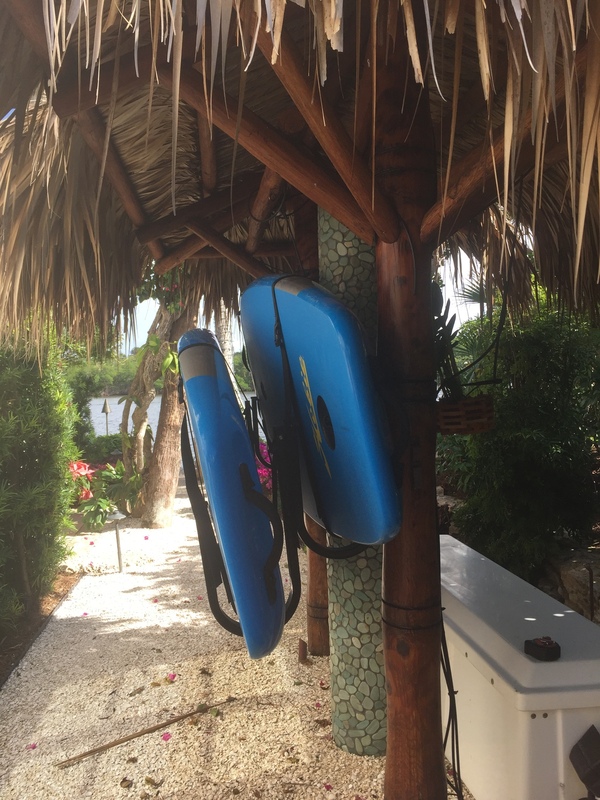 This is our galvanized weather resistant outdoor storage solution for saltwater environments, exactly where you need store your paddleboards! Have only 1 SUP? Here's the same rack for 1 SUP. Suspension Strap System. The Suspension SUP Wall Rack is a unique stand up paddleboard wall rack because it will store your board with zero pressure points. These suspension straps conform to your board's geometry and are what allow this rack to not create any pressure points on your board - awesome! Safety Tie Down Straps. The SUP rack has built in, adjustable safety straps to ensure your SUPs stay securely in place. This keeps your SUPs secure when they're stored outdoors in a windy spot or if someone might bump into your board. Hey! This is Josh from StoreYourBoard.com, here today with a Double SUP Outdoor Wall Rack. Here to check it out. It is made for outdoor use, any kind of water environment – saltwater, freshwater, anywhere it’s moist. It’s made from galvanized steel, so really, really rust resistant and then has a nice powder-coat finish as well. This is the double version of our very popular Single Suspension Wall Rack as well. If you can see on the wall, we have one paddleboard is in here, mounted directly to the wall, and then we have another unit. The ski hook, comes like ski hooks that is mounted to it, and there’s a plate system that just makes the two together. In the double, you actually get four of these individual units that you then weigh together, so you have two different levels. I’ll show you how to put the paddleboard in there, but this is how it comes. A couple of key features about the rack itself, in between these hues, there’s 8 inches of clearance. That’s an 8-inch thickness where a board can go in there. That fits most paddleboards on the market, so some of the very large displacement race boards, why not. just make sure to measure your board first. Depending on the thickness of your board and the length of your fin, you might have to mount that with the fin out in front or take your fin out. You also want to calculate kind of how much that fin is going to play. With the rack, like I said, it does have a suspension feature, which is here at the bottom. It cradles your board, so the board actually is not touching the metal. Really nice feature, depending on which board you have in there and it goes right into the contour. It cradles that board and also has that top strap. You can see up here, this looks like this. this is meant to secure it. Clip it. Then it just pulls tight, so it can really support those weights up paddleboard. You don't need this for the rack to work, but it’s nice specially when you’re outdoors when there’s maybe a little wind, when you know there’s kids playing, you want to make sure it stays in that rack nicely. An extra security feature. Here it is with one more board. I’m going to put this up in order to show you, just slide it in, and then it fits nicely. There it is with two, so you can see in front, you just see the back. It’s one. It’s a stepdown nicely. It’s really nice and compact. It comes out from the wall about 20 inches, so each of these racks comes out 10 inches, so you have to give the wall 20 inches when you store two large standup paddleboards, so it’s a great use of your space when you mount this on your dock, on your desk, on your patio. You want to keep it compact, keep these boards out of the way and also protect them because they’re expensive. As I mentioned before, you also have this. Use [unintelligible 0:03:01] snap that in, extra security. There it is: our Double Outdoor SUP Wall Rack. Check it out today at StoreYourBoard.com. Outstanding for Miami Beach salty air and powerful sun! I've purchased several SUP racks on Amazon for a bit less money and they never last more than a year. Although I just purchased these racks I can tell they will be able to hold up for many years in Miami Beach climate. The only complaint I have is with the screws as they are very low quality but not a big deal. I went to the local hardware store I purchased galvanized screws. But again, not a big deal at all. The main product is perfect. Very good and easy to put together. Exactly what we hoped for and needed! We bought the double hanger for our twin sons boards to hang on our garage wall. This hanger is very well made and allowed the boys easy access to their boards and minimal space coming out from the wall with the staggered hangers. Your video described them perfectly! Very well pleased! Thank you! This rack was large enough to store two peddle boards and left tons of walkway room to move around them. Install was easy. Yes, the wall plate that will be attached to the wall or the posts is 21.5" tall as you noticed, on thisdouble SUP galvanized rack; however, as you can see, the rack for the 2nd SUP will attach in front of that, but slightly lower down then the one in back (they are staggered). I don't have the exact measurement for how much lower the front rack extends down for clearance available in my specifications but as a guesstimate, it is probably about 10 inches or more you would need to have room for (so about 31.5" - it might be less, but it could be in that ballpark). We'll get that number updated here soon. I’d there a way to lock the boards onto the rack. This double SUP rack isn't available with a built-in lock, but we recommend Dock Locks that can be used to secure your boards to the rack and/or other stationary objects. The basic Dock Lock system includes a locking cable and one jaw clamp/cleat that can be used to secure the SUP to the locking cable; the jaw clamp attaches to the leash plug or fin box. You can also order additional Jaw Clamps for use with the cable, so that you can secure more than one board to the same cable. These work great with storage racks. What is the allowable distance between the mounting brackets? Can the brackets be attached to 4"x4" galvanized dock dock posts? The distance you set the two separate arm cradles apart for this SUP rack is determined by the length of the SUP you will be storing with them. So you need to basically be visualizing where the SUP will sit in the arm cradles -- you want ideally about a third of the SUP between the two arms (so if it was a 9 foot board, you have 3 feet in the middle and 3 feet on either end past the arm cradles, as an example - in that scenario, the brackets are being installed about 3 feet apart...). It doesn't have to exact in that respect, and how much nose or tail ends are hanging over on either side is flexible -- you just want to evenly distribute the weight/length of the board as best as possible. Normally, indoors, you want to attach it to wall studs, but dock pilings/posts can work fine. What is the distance is with the mounting holes on the bracket for the screws? For these gavanized suspension SUP racks, the mounting screws to attach the rack to the wall or a post are spaced 4" apart, and the top hole is 2" from the top of the back of the rack. Then the second SUP rack for this double-version will attach to the rear one in a staggered position (lower than the rear rack) using an included mounting bracket to attach it to the other rack.